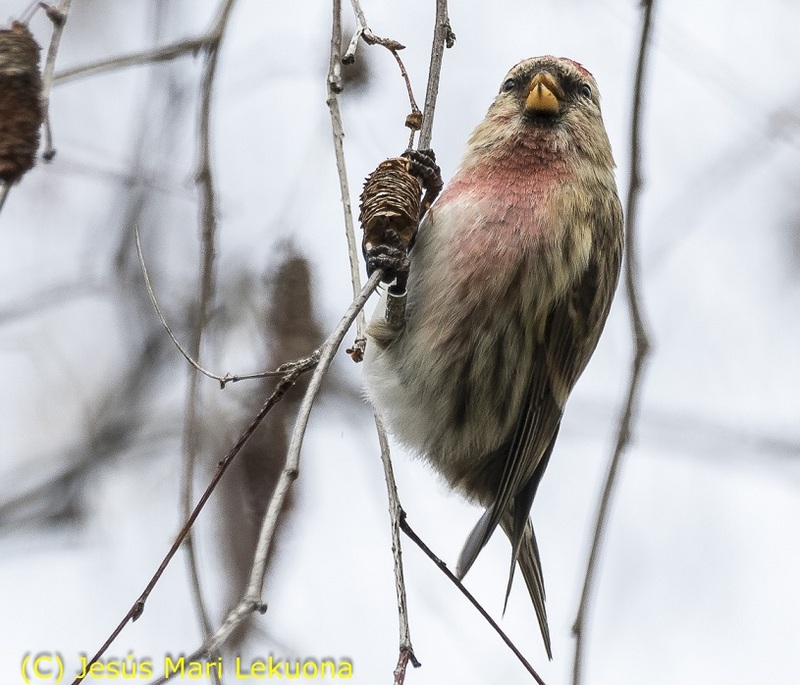 The species, or subspecies, of the Redpoll complex has long been something that birders and ringers have debated; the use of new advances in technology, like sonograms and DNA studies, have only fueled the discussions. There are currently three recognised species, Lesser, Common (Mealy) and Arctic Redpoll, with subspecies also acknowledged (depending on which criteria you use). Identification of these species can be difficult; however, ringers are in the privilaged position of being able to collect detailed data on size (wing length) and plumage to help inform the decision. Since 2010, the average number of Lesser Redpoll ringed by the BTO Ringing Scheme is 21,000 birds per year. The number of these that are later relocated is quite high in comparison to similar species. They have become increasingly common in gardens (as recorded through Garden BirdWatch) possibly due to garden bird feeding; this also offers additional opportunities for ringers to catch these birds. 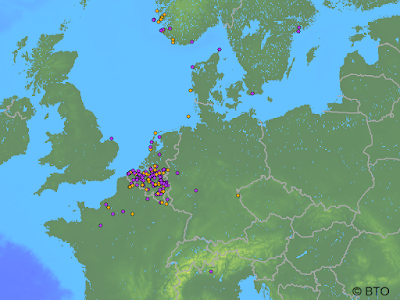 The map above shows the ringing and finding locations for all the Lesser Redpolls that have been ringed or reported in Britain and Ireland. This map will have to be redrawn later this year however, as we have now received details of a bird that had its metal ring read in Spain! During 2017, there were only two sightings of Redpoll in the whole of Spain, so 20 January 2018, when a flock of 15-17 birds turned up, was an exciting day; it was made even more exciting by the fact that one of the birds was wearing a ring! Unfortuantely, as the rings on Redpoll are very small, it is very difficult to read the ring number in the field; however, Jesús Mari Lekuona managed to read all but the last number. This narrowed the options down to 10 possible birds, and all of them were Lesser Redpolls of various ages (adult or juvenile), ringed on 14 October 2017 near Cinderford, Gloucestershire by Robin Husbands. As you can see from the photo, this bird is an adult male... and this matched a single bird, ringed at 12.30! This is the most-southerly recovery of a Lesser Redpoll, although there is a report of a 'Redpoll species' recorded in Portugal (before they were split into three species). In countries where certain species rarely occur, finding a bird with a ring can be really helpful, not only to increase our understanding of bird movements, but also to help validate such an unusual movement. 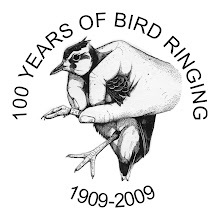 Thanks to Jesús Mari Lekuona, Ricardo Rodríguez, Jorge Nubla, Oscar Guindano and Jose Ardaiz for getting the ring number and Rare Birds In Spain for letting us know.